This entry was posted on August 16, 2013 by Sports Traveler. Before reading further, can you name the oldest NFL stadiums? Probably not but don't feel bad because I didn't know the oldest NFL stadiums before writing this blog. In 1920 a few men gathered in Canton, OH to form the most popular sports league in this country. Little did those men know what was ahead for the NFL and how much people would grow to love football. We love football so much that we gather by the tens of thousands to see our favorite teams play. All across the country we gather in stadiums to cheer and show our passion. We cherish these stadiums as they become a part of our vocabulary and community. We live now in a time where every team wants to be on the verge of designing the next state of the art facility. Soon the Falcons will move out of the Georgia Dome and into a spectacular new structure. The 49'ers will also be on the move at the end of the year as they will depart ways with the windy grounds of Candlestick Park. Everyone wants a new toy. But what about the old ones? 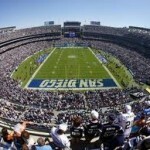 What are the 5 oldest stadiums in the NFL? 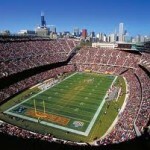 Soldier Field comes in as our oldest NFL stadium. The home of the Chicago Bears was recently renovated in 2001-03 and should be around for many years to come. It is only fitting that the 2 oldest NFL stadiums belong to the 2 biggest rivals. Many people out there say there is nothing better than a Bears & Packers game at Lambeau Field. This is a multipurpose stadium located right across the bay in Oakland. The Coliseum remains home for the Raiders & Athletics. Many, many events have been held here. 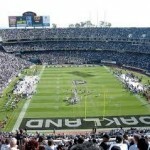 The fourth stadium on our top 5 oldest stadiums is the second venue in California. Qualcomm Stadium has hosted 3 Super Bowls and a World Series. Qualcomm is currently home to the San Diego Chargers. The last stadium on our top 5 oldest stadiums is also one of the loudest. 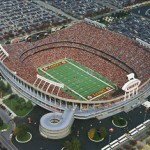 The Chiefs play with a major home field advantage and they are loved by the Kansas City faithful. All of these stadiums have grass fields. 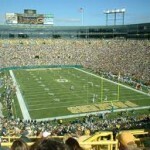 Although Green Bay uses the hybrid grass with artificial fibers. The rest of league is pretty much an even split between turf and grass. Another trend to notice is the capacity. The 6 stadiums that I have mentioned here have an average capacity of around 70,000. The rest of the league, newer stadiums, average out around a 74,000 person capacity. Moral of this story is we are seeing larger stadiums with more teams going with artificial surfaces. Its understandable why many of these teams choose to go away from grass based on location. Eventually we will not have any authentic grass fields in NFL stadiums. The best thing to take away from this list is that the two oldest stadiums in the NFL will not be going anywhere anytime soon. Soldier Field and Lambeau Field are two staples in NFL and American sports history. We will have the pleasure of watching the oldest rivalry in the NFL in the 2 oldest stadiums for many years to come. Nice to know the tradition of this great game will continue on hallowed grounds. New stadiums and state of the art facilities are great for the players and fans alike but relics like Soldier and Lambeau should forever be appreciated.